This is easily one of the best books I’ve ever read. The Peninsula of the Palm has been conquered by two tyrants: Brandin of Ygrath and Alberico of Barbadior. Both are sorcerers, who have devoured the dukedoms of the Palm in a quest to create rival Empires. The restive natives of the Palm, from the lowest shepherd to the highest Duke, want their freedom, but both sides rule with iron fists. Rebelling in Barbadior is punished with having your hands cut off, stuffed into your mouth and finally with being pinned publicly on a ‘death wheel’ (yikes). Meanwhile Brandin’s greatest punishment is erasure: the nation of Tigana was magically wiped from the minds of men and women, to exist only in the memories of a handful of people who are rapidly dying off. Barbadior has a stronger army than Ygrath, but Brandin’s magic is stronger than that of Alberico so both empires exist in a tenuous status quo as neither can risk open war with the other. Characters: are excellent. There are a ton of POV character, but I’m going to talk mainly about the two prime POVs. Dianora is a Tiganese woman in hiding, who has become Brandin’s chief concubine. She became his lover in an effort to assassinate Brandin, but in the process fell in love with the man who killed her family. Alessan was born months before the fall of Tigana, and is the secret younger prince of the forgotten nation who must reclaim his place within his nation and free the Palm from both emperors at once. Additionally there’s Brandin, a non-POV character. Brandin has sworn eternal hatred of the dukedom of Tigana because when he conquered Tigana his younger son was killed there. This, plus Dianora’s love for him, humanizes what would otherwise be an ‘evil sorcerer’ archetypical character. I almost feel sorry for him. I could go on with all the characters, but I won’t. 99% of them are good. Plot: I love political fantasy novels. This book’s underpinning is a political/military one. 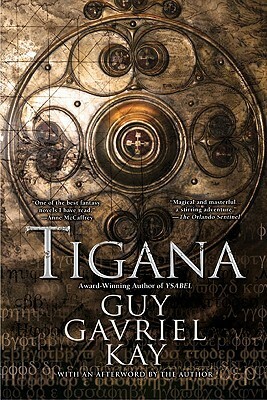 The people of Tigana want the nation of Tigana to exist, but Alberico and Brandin don’t want them to. The Tiganese can’t kill Brandin because that will allow Alberico to take over. They can’t kill Alberico because Brandin will become entrenched. To have any hope of freedom, they must kill both tyrants at once. And that is really, really hard because they are both sorcerers and have magical protections, making the timing of the assassinations very difficult. But even if the good guys want to defeat the tyrants, they aren’t spoiled for allies. All the different enslaved dukedoms- Tigana included- have traditionally hated one another, making trust between them difficult. This led to a compelling setting and character conflict between the various factions. Pacing: was good. Never too fast, never too slow, just right. 99% percent of the characters were awesome. Alberico, on the other hand… well, sometimes you need Mr. Mctwirly Mustache to make the other characters look better. Alberico literally has no redeeming factors. He killed people randomly. He tortured men, women and children to death. He hates the Palm, and is planning on using it only as a stepping stone to greater things. I know Gavriel Kay can do better than this. The author didn’t write a compelling antagonist. And finally the ‘Night Walker’ plotline felt… out of place. It just sort of happened, and was sorta shoehorned in. It played well into the finale… but if the author just left it out the finale would have worked fine just the same. The author didn’t sufficiently blend this storyline into the fabric of the rest of the story in my opinion. And that’s about it. I can’t think of any more negatives. This was an all around strong novel with few substantive flaws, carried by one or two super strong characters. I’m adding Dianora in particular to my pantheon of favorite characters ever (joining characters such as Kvothe, Ista, Ammar/Rodrigo).